I’ve asked everyone to come at HIGH NOON. I come a half-hour earlier with gifts and with my sign: HUMAN FAMILY REUNION—WORLD HEADQUARTERS. Three tables have been pulled together for us in the upper room, at the back of the restaurant. I take the seat at the near end of the table. From here I can see as folks walk in off the street and come through the door. “Up here, Mike, I call.” He’s the first of the eleven others to arrive and takes a seat just beside me on my right. Anna comes next; Roger close behind. Anna sits to Mike’s right. Roger takes a seat on the other side of the table, opposite Anna. Then Jason. He takes a seat across from Mike. Bassam is next and takes a seat between Roger and Jason. Laura comes to sit on Anna’s right. Mitzi takes a seat to Roger’s left. My phone rings. Yahya is on 291 and needs directions. Soon he comes. He takes the seat beside me to my left, beside Jason. Al comes to sit beside Laura and across from Mitzi. Angela called to say she had to accompany her pre-schoolers to the zoo and wouldn’t be able to come. Samuel is expected. Blath grew up in Ireland, married an American and has lived in Liberty for years. She waits on us. “Each of you is a special person in my life,” I say, “when I first thought of this lunch and its purpose, your faces came to mind. I had sensed something in you that made me think you would want to be here. Yahya, Al, Bassam and Samuel are Muslim. The others of us are members of Second Baptist Church. I recently saw a DVD about Baptists and Muslims working together here in America on projects of mutual interest. Some of us have seen it. We will show it at church sometimes soon. And we want Al, Bassam, Samuel and Yahya and their families to come visit our church some Sunday this summer. Magic ensues. A Camelot moment in time where our shared membership in the Human Family comes to the fore as never before, where all the noble sentiments that inspire our lives become flesh and take a few deep breaths. Lively private conversations erupt between those sitting close. The lovely food placed before us and the lovely fellowship that bubbles up from within us all elevates the room and all of us. Other diners sit at the three tables that line the wall behind us. As I wonder to myself what they must make of what they see and hear of us, I imagine the conversations they will have with their friends later in the day. Our town will be drawn higher and become nobler as these conversations play out. I planned for us to sit together in a space visible to everyone in the place so that our presence could be seen and become a part of everyone’s awareness. Years ago my church, Second Baptist here in Liberty, appointed me as Ambassador to Other Communities of Faith. I regularly over all this time have taken folks from my church to visit folks in other faith communities and have brought folks from other faiths to visit my church. The understanding between us has always been that we do not come to join each other or change each other. Our sole, and soul, agenda is to form friendships across faith lines. When times come that tensions arise between our faiths, our friendships could offer trusted information and insights that might prevent violence. With some reluctance I raise my voice to focus our attention. I want us all to know one another. 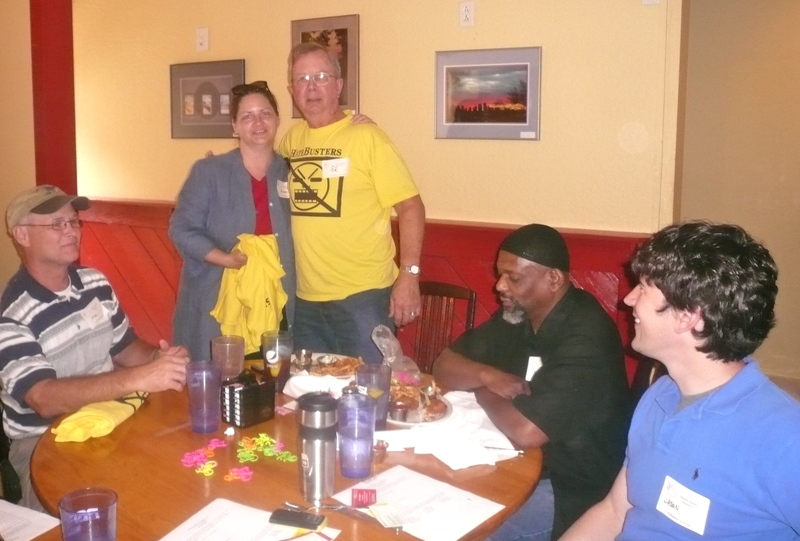 Beginning with Bassam, we move leftward around the table as each of us takes a couple of minutes to introduce ourselves. Al says, “Even though I have reached the heights of professional accomplishment and material comfort I still feel strange centered in the attention of others. Like many folks I have grown used to being on the periphery, an abbreviation of another person’s awareness, and treated as a problem when I dissented from their assumptions or patterns of reality. As a Muslim American this has been true from those who looked like me and those who did not share my hue or views. Since 9/11 I find it refreshing that more people than not stand in liberty wanting to meet me and I them. 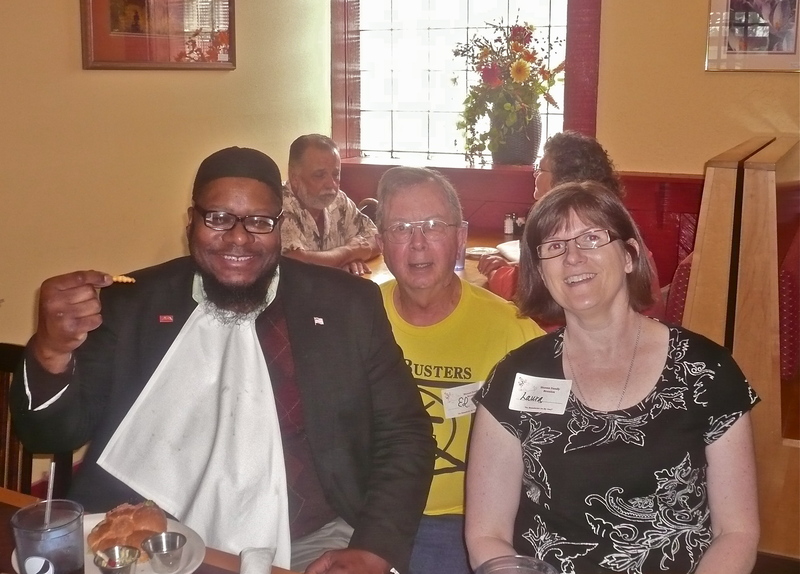 So HateBuster’s, Human Family Reunions, and First Suppers are fun affirmations of the greater truth of love I exchange with persons of many faiths and ethnic origins. “Nearing 60 I find myself struggling to be and become a full human being as G-d created us all. Clearly past the apex of life I reflect on the value of time and revel in the truth-seeking atmosphere we create here at Ginger Sue’s. Why is it so hard to come by? Sure would be nice to know this feeling everyday. While the drive is some miles distant I realize that in many ways the largest distance is across the table to other human beings who are very much more like me than not. Here and now I feel a need to connect with and include my 20-ish children in this non-judgmental conversation. Regrettably, the fullness of my liberating experience has not passed the age gap. “In many ways their youth precludes understanding what experience alone can convey. Wondering if I will see it in my time I pray they grow in the environment we have made and grasp the joy of togetherness that we cherish. So far like so many others I am exhausted by the parental task of conveying the far easier defensive life-preserving lessons of suspicion, criticism and distrust. There is little time or inclination for the impractical pursuits of true love, real intimacy (not about plumbing), personal equality and honest justice. So next time I will invite my children to survive and thrive by joining us in this wholesome work. Laura says, “I spent the first 7 years of my life in the south-Texas, New Mexico, and Louisiana. My best friend in kindergarten and 1st grade was Donny, a black boy my age. Our teacher, also black, did not think it appropriate for the two of us, a white girl and a black boy, to be friends. I didn’t understand why not. I had other friends who were boys, so I failed to see the difference (literally did not “see” the difference). Growing up, I never once heard any type of racially prejudice comments from my parents. Living in South Carolina as an adult, I heard comments from white people that would make my mouth drop open in disbelief. I had never been exposed to that kind of thinking and was incredulous to realize that someone would not only think so horribly about their neighbor or co-worker, but would actually express such hatred out loud. It opened my eyes to be very aware of the actions and words of others. Now I am an Occupational Therapist working in a rural school district providing therapy for kids who have special needs. I see how accepting younger kids are of children different than them, but as they get to middle school or high school, the teasing and cruelty start. We are all different than each other. In my opinion, life would be incredibly boring if we were all exactly the same. But yet, what matters inside is all the same. Ed said that no one is born with hate. I see that to be so true. We each have a part in preventing hate from taking root and spreading. We can not allow it’s ugliness to grow. We have so many wonderful lessons to learn from those around us if we take the time and listen. Yahya says, “My name is Yahya Furqan, and I am a Muslim Leader or Imam. I have functioned in this capacity since 1973. I have served on National and Regional Councils as well as State, but my work is not done. It is a pleasure to sit in the company with those who dignify themselves in the working as HateBusters. 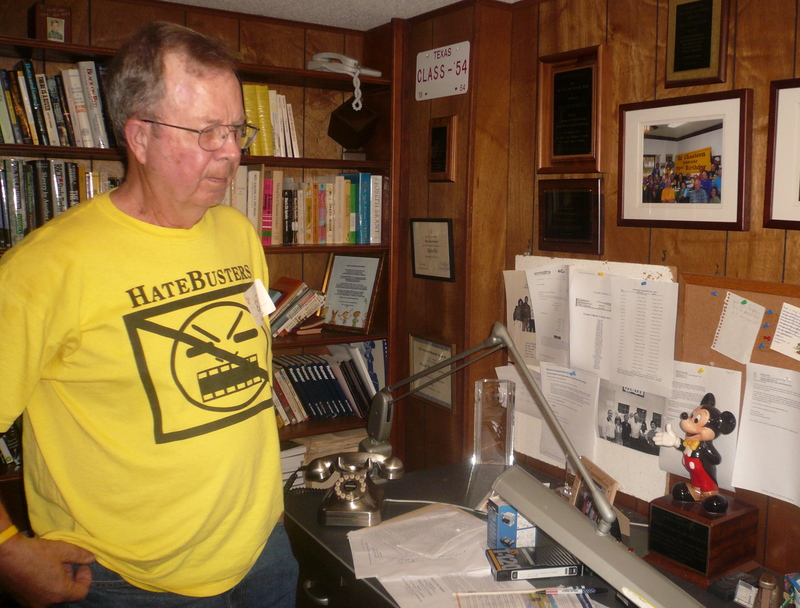 “I was born in Missouri, but at the age of six we moved to Topeka, Kansas. During the time we lived in Topeka, Ks. our neighbor, and my sister’s best friend was Cheryl Brown of the Brown vs The Board of Education. At the age of twelve I moved with my parents to Europe, we lived in La Rochelle, France for three and a half-months. The President of France ordered the U.S. Military Forces out of France in 1963. At that time we moved to Bremerhaven, Germany. There I went to school at the Bremerhaven American High School. I lived in Germany from 1963 till 1966. I was living in a country that did not express itself with the racial intolerance of America and the U.S. Military did not discriminate at that time. We were interracial Americans and thought nothing of socializing together. I’m in contact now with my classmates from Germany and plan to attend the next Reunion. 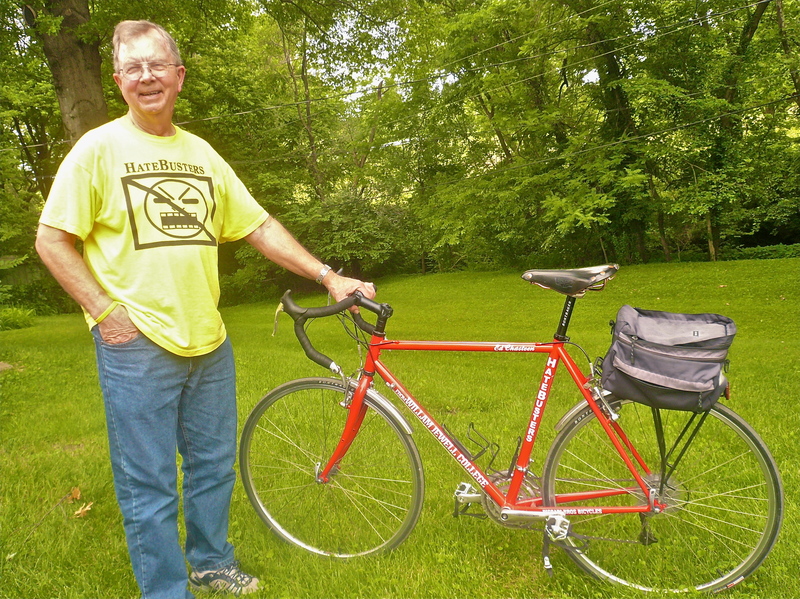 “When I returned from Germany in 1966, I faced a culture shock. I came into contact with people, not knowing me, but hating me because of my race. I was not prepared to be treated differently because to the color of my skin. This was senseless to me it disappointed and angered me. I did not like or understand that at all, I had no reference point. “By the time I was seventeen I had found no comfort in a purely militant response to racism. I wanted to understand the cause of that evil. In the Black community I found the only white man respected was the image of Jesus. I heard a lot of hatred for white people from among the oppressed African America. I saw fear, resentment and hatred. Hatred is no solution and I rejected it for the peace that our Creator invites us to. “In Europe I was socialized in an integrated society. I saw G_d as Creator, and Humanity as a single family, with a diversity of expressions in race, tribe and culture. I eventually came to read and understand the Qur’an; I had a great teacher, Imam W. Deen Mohammed, I became his student and later was asked to represent him in the Kansas City, Mo. Area. 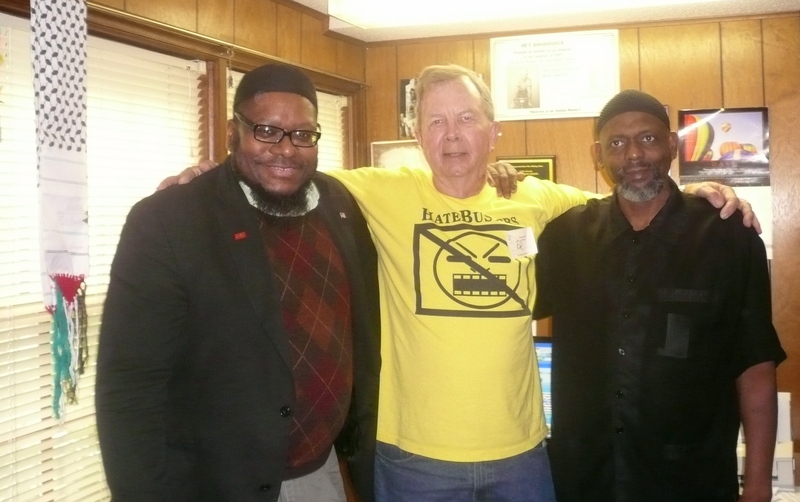 I introduced Ed Chasteen to Imam W. Deen Mohammed, the leader of millions of Muslims in America and throughout the world. He was responsible for the building of bridges between the Muslim and Christian faiths and a friend to all people of faith, regardless, Muslim, Christian, Jews and others. I recommend that you goggle the name, Imam W. Deen Mohammed. 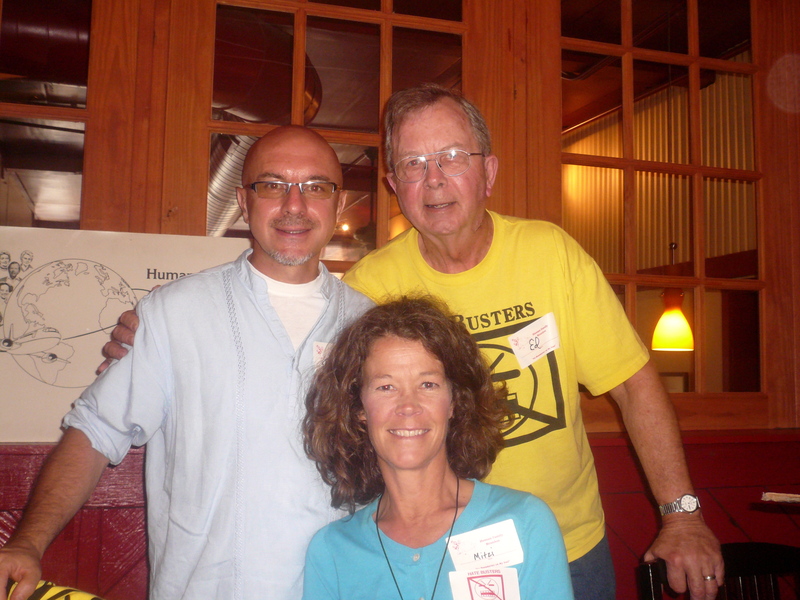 “I met Ed Chasteen, in 1981, when he brought an exchange student from Japan, to assist it the Sis. Clara Mohammed School of Kansas City, where I was the Director. “We found we were kindred spirits of different faiths; we never tried to convert each other. Being true to our respective faiths we found friendship. More importantly we began to work together as leaders of the Christian and Islamic Faith. We have been friends working for the common good in society for over 30 years. We fought racism by touring America on the “Ebony and Ivory Tour” of 1992. 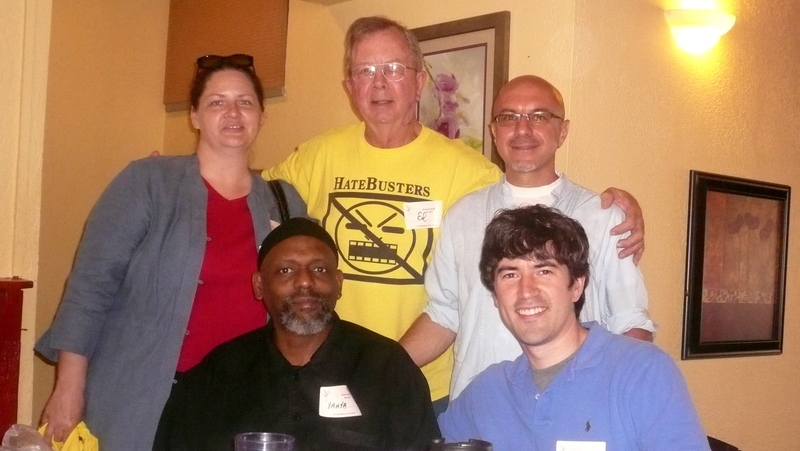 I was a founding board member of HateBusters, and I cherished this effort of fight hate. Anyone can work with someone of the same faith; Ed and I found a joy in building bridges between people. Angela and Samuel are not here to introduce themselves. But by email they send this to tell you. I have brought HateBusters membership cards to give everyone. Everyone also gets a yellow HateBusters T-shirt and a set of three cards showing the three-step formula to like people who are not like you. When I go to pay for our lunch, Blath tells me that some anonymous Good Samaritan has picked up the check. Just before we leave we all agree that Sunday, July 25 is a good day for Al, Bassam, Samuel and Yahya and their families to visit Second Baptist. They will be guests in Roger’s Sunday School class. We all will then attend the morning service to hear Jason preach. Mike will arrange a lunch at the church after services. I have promised that HateBusters will respond to any act of hate occurring within Greater Liberty. On this same computer, I send out word to the many hundreds of HateBusters whose email addresses I have. We come quickly to the aid of those who have been hurt because someone hates them. Whatever need they have, we fill. We go to court with them. Get them a lawyer. Raise money. Write love letters to them. Hold prayer vigils. Organize support and public rallies. And we do it all for free. We never say no when asked to help. Al, Bassam and Yahya drive to my house. I want to show them HateBusters Headquarters. I take them in through the garage and down the stairs to my basement office. My computer sits on the other side of the wall from the washing machine. On this computer word comes to me now and then that hate has erupted somewhere within the 125-mile circle I have drawn around my hometown of Liberty. I call all places within this circle GREATER LIBERTY. Greater Liberty is both a place and a principle. The place I’ve just described. The principle? We all have Greater Liberty than we realize to live above and beyond the limitations we think other people require of us. Bassam has brought his camera. He took some pictures at our lunch. He takes some now in my office. Then we go into my yard. I have just had my bicycle painted a bright red and lettered in white. It’s gorgeous. On one side of the downtube, the letters say, THE PEDALIN’ PROF. The other side says, FROM WILLIAM JEWELL COLLEGE. 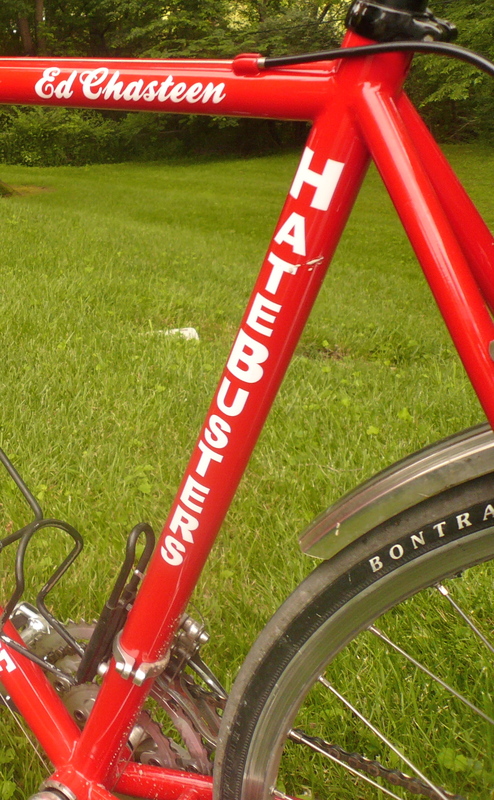 On either side of the seat post in big letters: HateBusters. And in script on both sides of the upper bar, my name: Ed Chasteen. Bassam takes pictures of my bike.